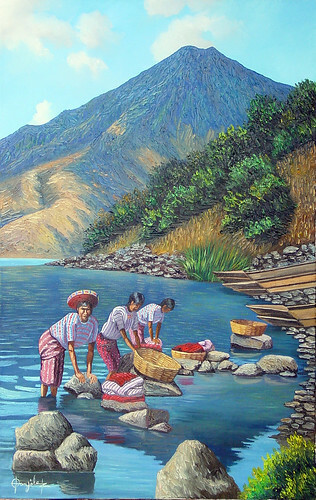 Mayan art takes many forms including woodcarving, weaving, ceramics, and painting scenes of daily life, like this painting of Tzutinil women washing their clothes in Lake Atitlan, Guatemala, while Volcan San Pedro looms in the background. As with every civilization, the art of the Mayans is a reflection of culture and lifestyle. Many of the great forms of Mayan art, such as inscriptions and architecture, were ordered by Mayan kings to memorialize themselves, as well as ensure their solid place in history. The most common subject for their artwork were not anonymous priests and unnamed gods, but rather men and women of power that serve to recreate and preserve the history of the people. The works are simply a reflection of Mayan society and its interaction with surrounding people. Back in early Mayan civilization, it wasn't hard to find people who appreciated Mayan art, and appreciated it for its strong cultural representation. Unfortunately, due to the humid climate of Central America, very few Mayan paintings have survived to the present day. The colorful Bonampak murals, dating from 790 AD, show scenes of nobility, battle, and sacrifice. At San Bartolo, murals dating from 100 BC were recently discovered which closely relate to the myth about the Mayan maize god; the colors are subtle and muted, the style, although very early, is already fully developed. Wall paintings have also been discovered in caves, such as Naj Tunich.